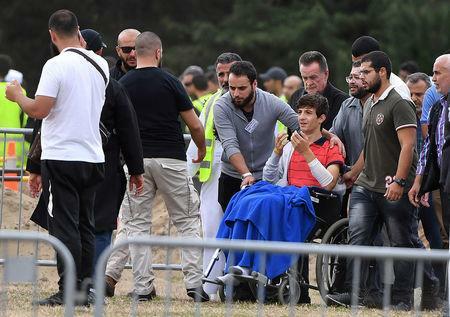 The majority of victims from Friday's attack in the South Island city were migrants or refugees from countries such as Pakistan, India, Malaysia, Indonesia, Turkey, Somalia, Afghanistan and Bangladesh. Hundreds gathered to mourn, some men wearing a taqiyah (skullcap), others in shalwar kameez (long tunic and trousers), while women wore hijabs and scarfs. The bullet-ridden Al Noor mosque, where more than 40 people died, was being cleaned and repaired for Friday prayers. The attack was broadcast live on Facebook and quickly distributed to other platforms, prompting Ardern and others to rebuke the technology companies. A group of state-run New Zealand investment funds with a combined NZ$90 billion ($61.5 billion) in assets said they were putting their investment heft behind calls for Facebook, Google and Twitter to take action following the livestreaming and sharing on social media of the attack.